I mentioned yesterday that I managed another ride on a bendybus in Plymouth other than the Stagecoach Devon Volvos on the X38. 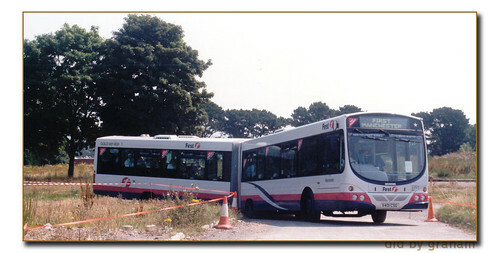 First Western National had its bus rally on the Seaton Barracks site back in 2001 as the Hoe wasn't available. One of the vehicles down for the day was First Manchester 2201 X401CSG which proved extremely popular on the free rides. Just getting in and out of the site which was just waste ground provided some very tight turns which added to the fun of bendy bus riding. A few more photos from this event tomorrow night! 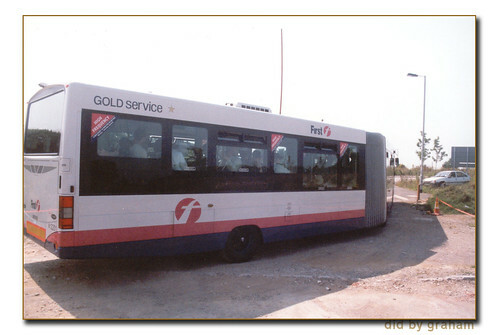 I remember riding one of these back in Southampton a few years back. It was pretty comfortable, though strange seeing half the bus disappear round the corner before your half followed. Also, this First Hampshire bus was a bit on an anomaly. Remember the coloured line liveries from a few years back (5/6 Green, 1/2 Red, 14 Orange etc)? 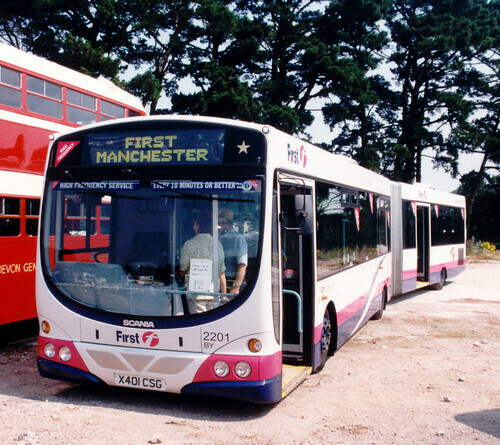 This one had a duel route livery for some reason - Purple 5 and Turquoise 11.